Earlier this week I met Terri for dinner at Pizza Express--it's a great place for, well, pizza. It's not a fast food restaurant, though, like the name suggests. They have all types of delicious salads, pizzas and pastas and appetizers like dough balls... hot garlic-flavoured balls of baked dough served with soft butter. We topped those off with a fresh pizza and glass of red wine, yum! After dinner, Terri and I bounced around to a few places--as is the custom that comes with living here and walking everywhere you go--and ended up at McGinty's Ale. The pub with the pig on the front. Now I know a lot of people feel like all we've been doing is frequenting the bars and drinking too much, but, like the food, it's a huge part of the culture here. Needless to say, Terri and I got a bit of a beer education at McGinty's and sampled the pub's house ale they brew in Perth (Scotland, not Australia). It was nasty and bitter, the bartender admitted he hated the stuff. He said the barrels are given great attention though, they're uncorked and left to stand for 24 hours, then tapped and stand for four more hours before being served. The tap goes all the way to the bottom of the barrel and any time someone orders a glass, the bartender has to hand-pump the beer. 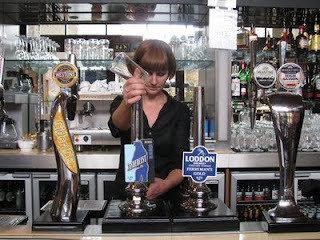 The hand pumps are pretty common in Scotland, you usually see at least one or two at the local bars. 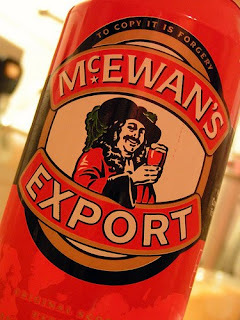 After deciding the homegrown ale wasn't worth finishing, Terri and I ordered a McEwans. This has become one of my favorite beers, it's a lighter ale with a really smooth finish. And it's not too heavy so you can have two or four and it still tastes good. But every time I've ordered it at a beer (and not all the bars have it on tap), I get a funny look. It happened again at McGinty's so I asked the bartender if it was just a crappy beer and no one drank it. He said it was a very nice beer but that you don't normally see women drinking pints. And you don't normally ever see women drinking pints of McEwans! He compared it to being an "old man's beer," like a guy that's drank Pearl or Natty Light all his life. I take a bit of pride in relishing an acquired beer. And besides, I like the jolly-looking pirate fellow on it. Life here is good, the weather is still getting colder and the wind is really picking up. It'll be worse when it rains and the water is driven in horizontal sheets on the gusty breezes that kick up every day. I'm still dog walking in the mornings and having a great time. This week I've gone on some trails in a very wooded area, lots of soft pine needles blanketing the ground and rays of sun glinting off of mossy covered stones and tree trunks. I went on a really great interview a few days ago and the job seems perfect, and I should hear something by next week. I won't go into more detail in hopes of not jinxing anything! Hopefully I'll land something part-time and keep up the freelance writing and dog walking as I can. Mike's job is going great as well, he really enjoys the group he works with and just spent this evening helping one of the guys move into his new flat. We are blessed to have come in contact with such friendly and welcoming Scotsmen and ladies!